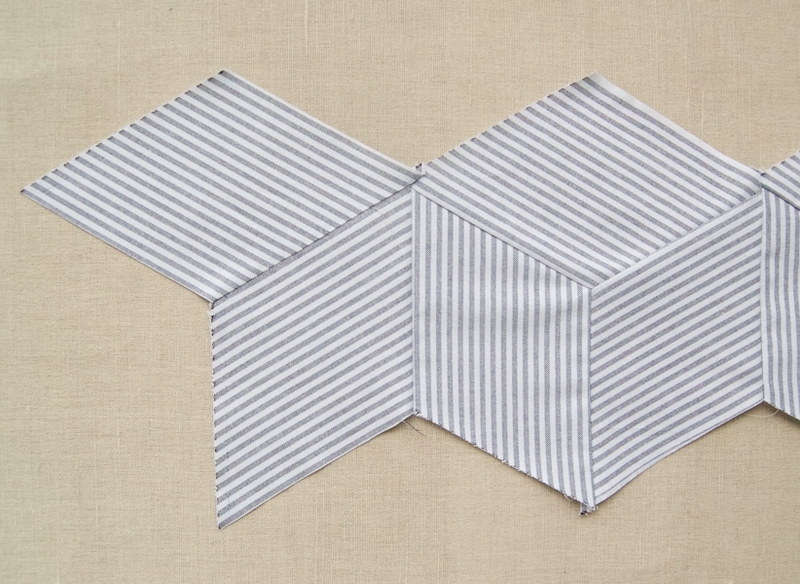 Our Striped Tumbling Blocks Quilt is a story of seeming simplicity coming from seeming complexity. At first glance, you may see a straightforward field of stripes, but then the terrain may rearrange itself into a magical three-dimensional city of cubes. And then, you may realize that, really, every piece of this quilt top is identical and that its creation required no magic at all! In quilt making, as in life, I have found that nothing is as hard as it seems, if you just break the task down into manageable steps. This Striped Tumbling Blocks Quilt is a prime example. 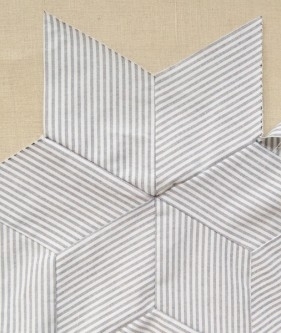 While the Y seams and odd angles of this classic quilt block may seem daunting, there is nothing actually hard about it. Just work carefully through the pattern and allow the illusion to unfold! Prewash, dry, and press all of the fabric (but not the batting) before beginning. If you are using a fabric without a clear right or wrong side, as we are here, just choose either side as the right side. Cut four 52 X 2 ¼-inch strips. 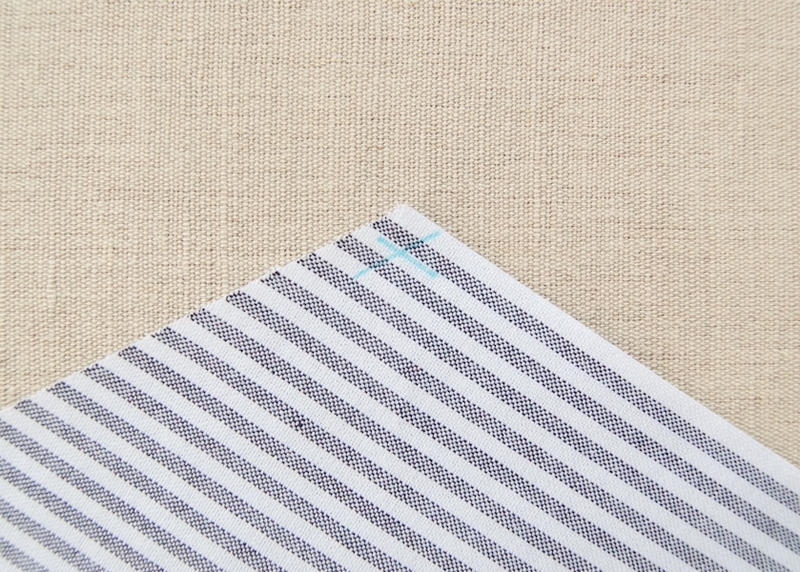 These are the Binding Strips. Put them aside until the “Bind” section. Cut a 43 x 50-inch rectangle. This is the backing. Put this aside until the “Baste” section. 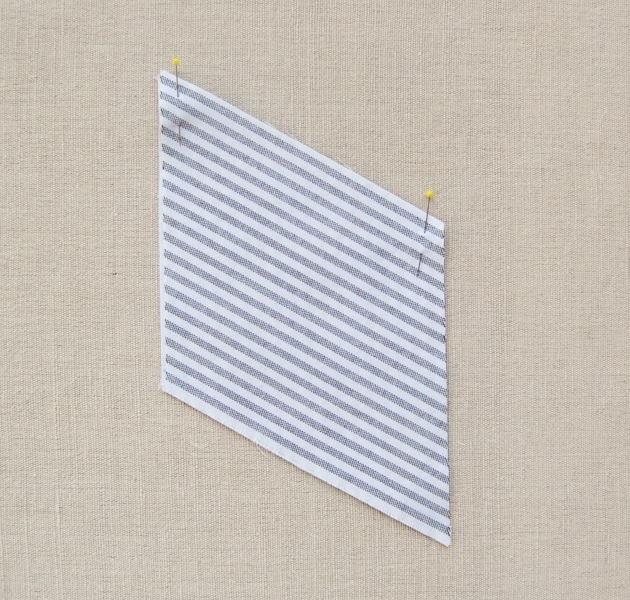 With the wrong side of the fabric facing up cut a 54 x 4 ¼-inch strip. 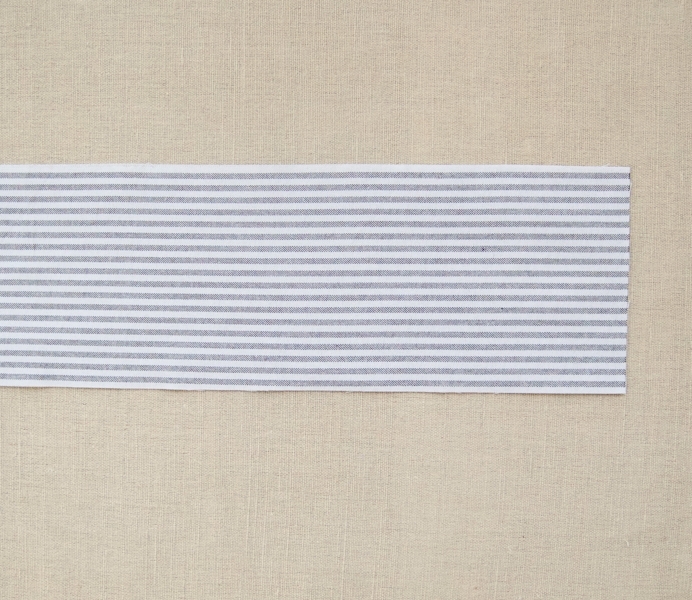 Cut it so that the stripes are parallel to the long edges of the strip. Orient the strip so that the long edges run along the top and bottom and the wrong side of the fabric is facing up. At the bottom right corner, use the markings on your rotary cutting ruler to measure a 60-degree angle. The 60-degree mark of the rotary cutting ruler should run along the bottom edge of the strip, creating a 60-degree angle between the bottom edge and the right-hand side of the ruler. Use the rotary cutter to cut along the right-hand side of the ruler. 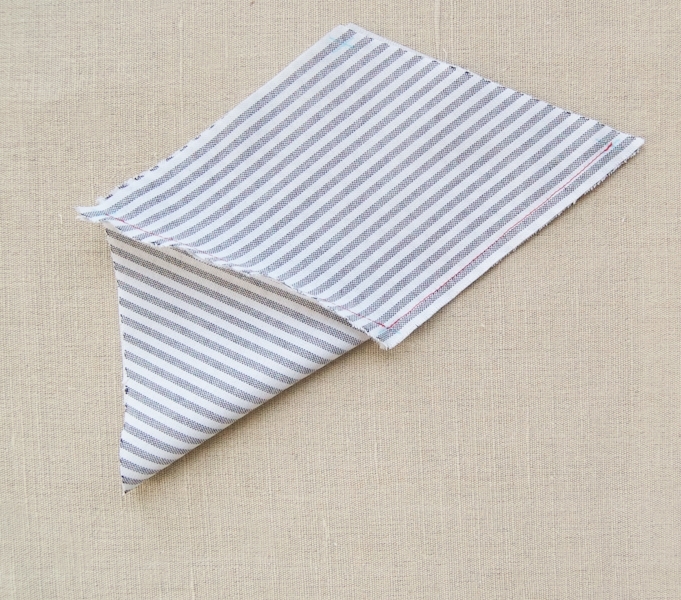 Discard the corner piece of fabric, or save it for another purpose. 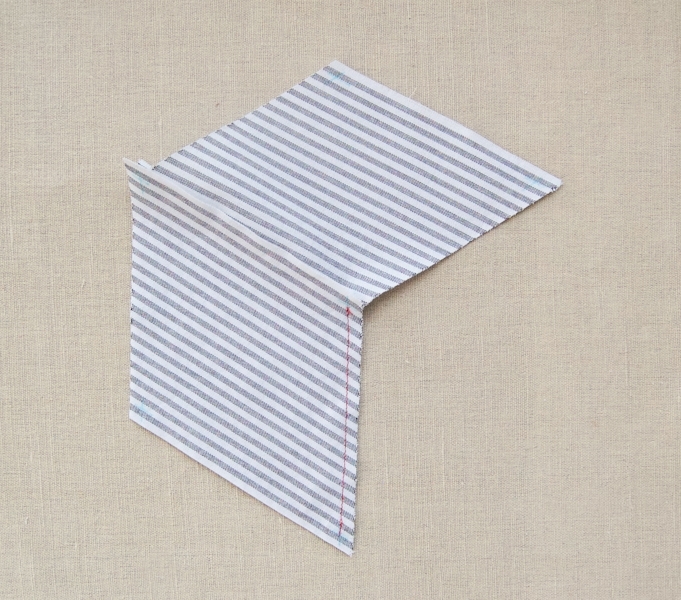 Fold the cut end of the strip upwards until it meets the top edge of the strip. Finger press this equilateral 60-degree triangle in place. Place the ruler along the left-hand edge of this triangle. Again orient it so that the 60-degree mark of the rotary cutting ruler runs along the bottom edge of the strip, as shown above. Use the rotary cutter to cut along the right-hand side of the ruler. Unfold the resulting triangle, and you’ll see that this piece is actually an equilateral parallelogram (aka a rhombus)! Press the piece flat. This is your first piece. Repeat these instructions to cut 108 pieces. Flip the pieces over so the right side of the fabric is facing up. 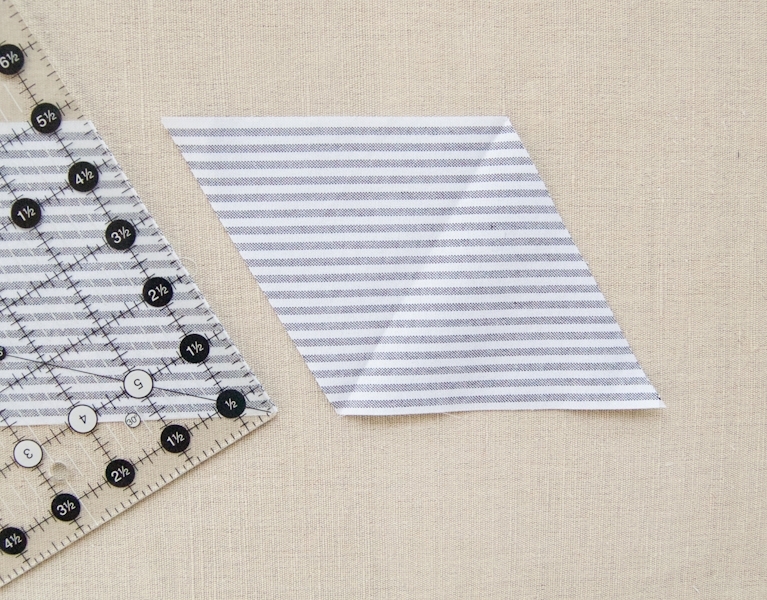 Line the Quilt and Sew Ruler ¼ inch from and parallel to a straight edge of a piece, and make an approximately ½-inch mark at both the corners. Do this along all four edges. You will be left with four “X” marks, one at each corner. The center of each of these X’s is a Corner Point. Repeat for all 108 pieces. Piece B has the stripes running straight up and down with the acute angles at the upper left and lower right. 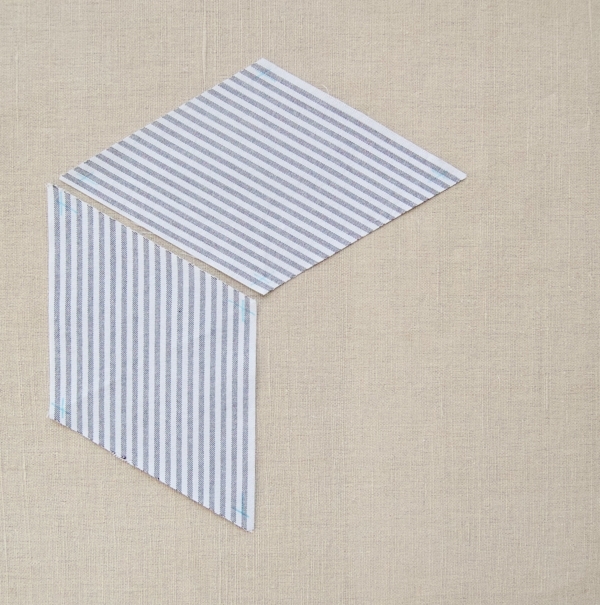 Piece C has the stripes running from upper right to lower right, with the acute angles at the upper right and lower left. First, pin the pieces together at the two Corner Points. Place the pins exactly through the Corner Point of both pieces, lining them up as perfectly as you can. Then, pin together the edges between the two Corner Points. 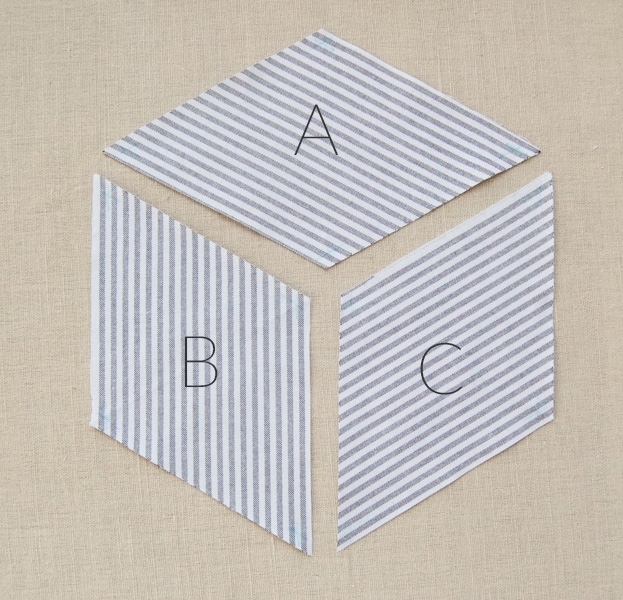 This is how you will pin all the Pieces A, B, and C that you sew together for this quilt. Note: I used red thread to clearly illustrate these seams, but you should use thread to match the fabric. Open up the piece and you will see you have accomplished 2/3 of the Full Tumbling Block. Keep it oriented so that Piece A is on top and Piece B is on the left. Next you will sew the left side of Piece C to the right side of Piece B. Place Piece B on top of Piece C, right sides together. 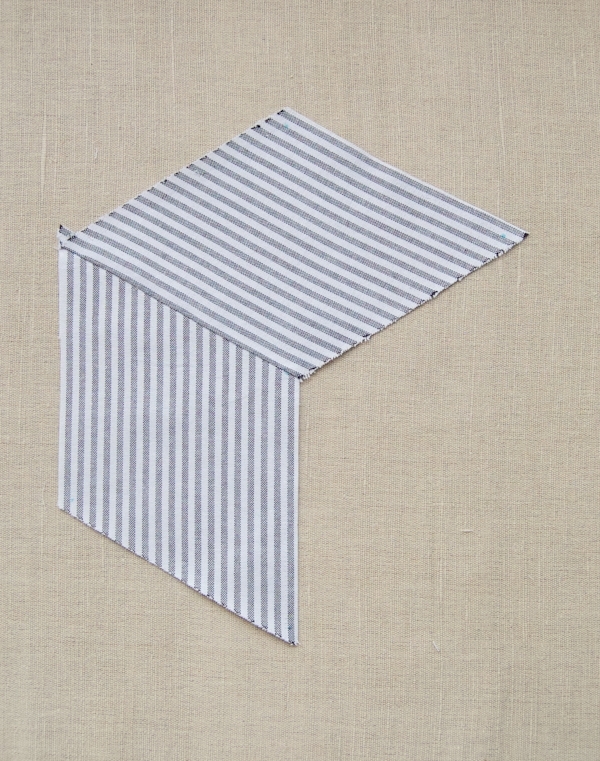 Pin the two edges together as described for Seam 1, first pinning through the Corner Points and then pinning in between. 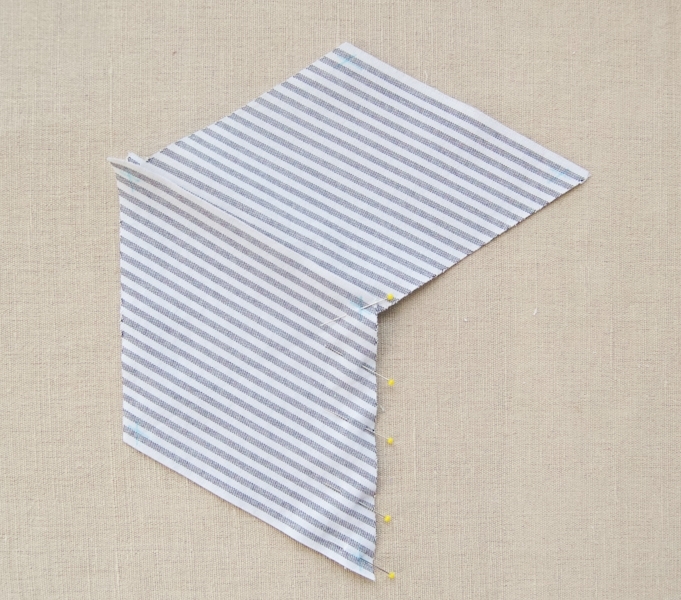 Sew this pinned side together in the same way you did Seam 1, starting and stopping precisely at the Corner Points, backstitching at the beginning and end of each seam, and being very careful to not sew into the seam allowances of any of the pieces. You will really see the Full Tumbling Block coming together now, with just one more seam left to sew: the top edge of Piece C and the bottom right edge of Piece A.
Pin these two edges together in the same manner as for Seams 1 and 2 . Pull Piece B away from Pieces A and C so that it doesn’t accidentally get pinned as well. 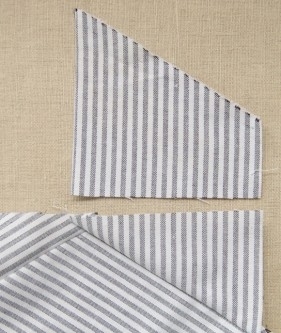 Sew along the pinned edge in the same manner as for Seams 1 and 2. One Full Tumbling Block is now finished. Do not iron it flat. You will press it and arrange all of the seam allowances once the quilt top is finished. The center should come together in a neat intersection of three 120-degree angles, as shown above. Create 27 Full Tumbling Blocks by working through the steps of Seams 1, 2 and 3. While you can’t chain piece these blocks together in the traditional sense, you can make this process a bit quicker by creating an assembly line: pin all the pieces for Seam 1, then sew them all; pin, then sew, for Seam 2; pin, then sew, for Seam 3. This is a Left Partial Tumbling Block. To make it, you work just Seam 1. Sew three Left Partial Tumbling Blocks. This is a Right Partial Tumbling Block. To make it, you work just Seam 3. Sew three Right Partial Tumbling Blocks. This is a Bottom Partial Tumbling Block. To make it, you work just Seam 2. 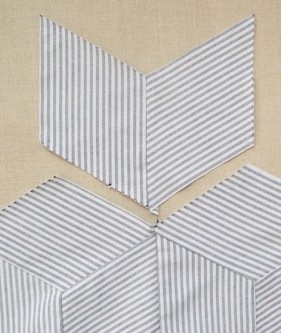 Sew four Bottom Partial Tumbling Blocks, and put them aside until the “Finish the Top” section of the pattern. In order to communicate clearly, I’ve assigned each side of the Full Tumbling Block a number, as shown above. Please refer to these numbers as you sew the rows. Gather five Full Tumbling Blocks and sew them into a horizontal row by sewing Side 6 of a right-hand block to Side 3 of a left-hand block. Pin and piece them the same way you have done all of the other seams: pin through the Corner Points, backstitchat the beginning of the end of each seam, and only sew exactly from one Corner Point to another, making sure you don’t sew into the seam allowances. Repeat this two more times so you have three rows of five Full Tumbling Blocks each. These are Rows 1, 3, and 5. Begin the next horizontal row with a Right Partial Tumbling Block and piece its right-hand side to Side 6 of a Full Tumbling Block. Continue the row by piecing three more Full Tumbling Blocks to Side 3 of each previous block. 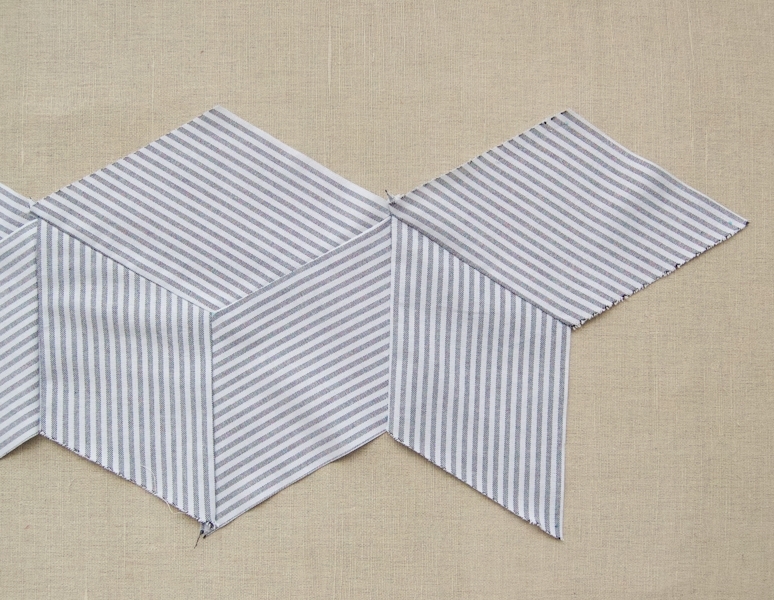 Finish the row by sewing a Left Partial Tumbling Block to Side 3 of the fourth Full Tumbling Block. This row has 6 total pieces. From left to right, they are a Right Partial Tumbling Block, 4 Full Tumbling Blocks, and a Left Partial Tumbling Block. Now, lay a rotary cutting ruler along the vertical edge of the Left Partial Tumbling Block, and using the rotary cutter, cut Piece A in half lengthwise to make its edge flush with Piece B. It is now a Half Tumbling Block. Repeat this for the Right Partial Tumbling Block at the opposite end of the horizontal row. Repeat both steps also for the two other rows you just made. These three rows are Rows 2, 4, and 6. 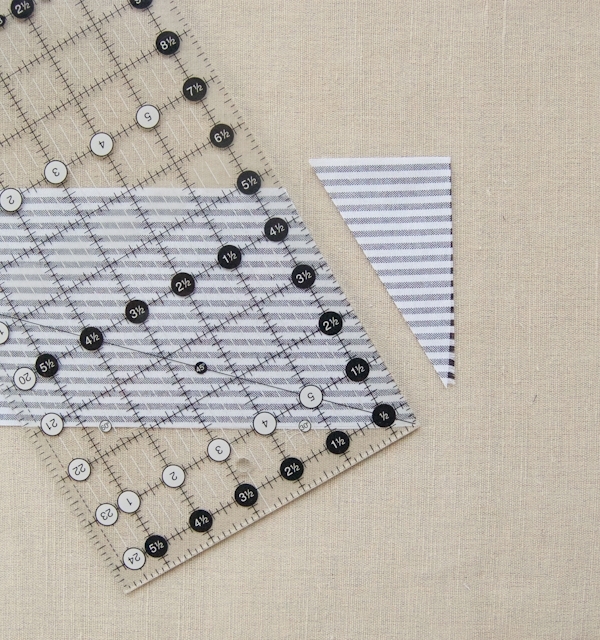 You will now begin to pin and sew Rows 1 and 2 together. They fit together in a zigzag, as shown above. Row 1 starts and ends with a full Tumbling Block. Row 2 starts and ends with a Half Tumbling Block. Place Row 1 on top of Row 2, right sides together. Pin, as you have been pinning, all of the Side 4’s of Row 1 to all of the Side 1’s of Row 2. 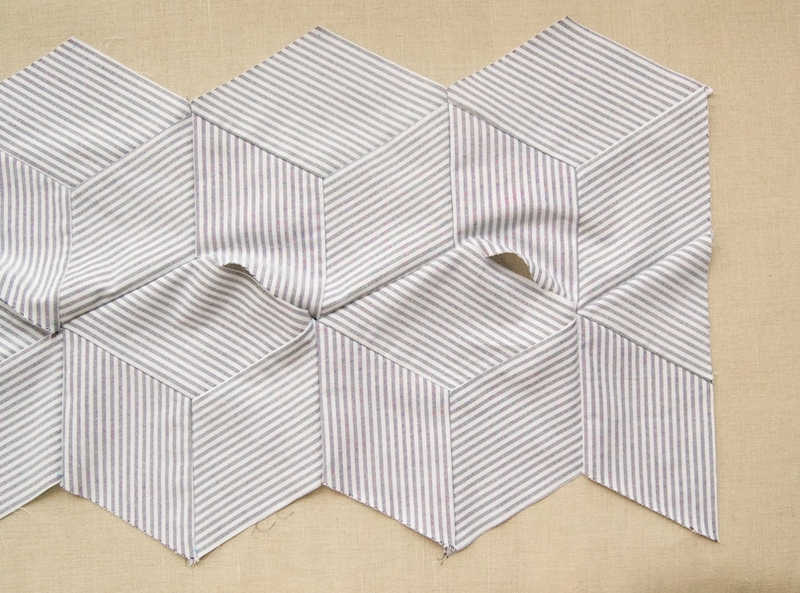 The pinned together Rows will get a little twisted, as shown above. 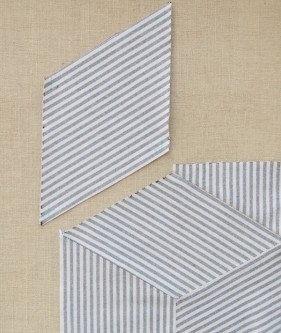 Sew these pinned sides together, just as you have sewn all the other seams. 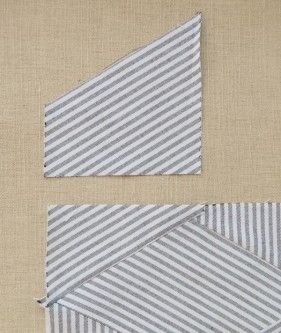 When you look at the right side of the two partially sewn rows it should look like the photo above, with only half the connecting edges sewn. Fold Row 1 over so that the right sides of the rows are facing each other, and this time, pin the Side 5’s of Row 1 to the Side 2’s of Row 2. 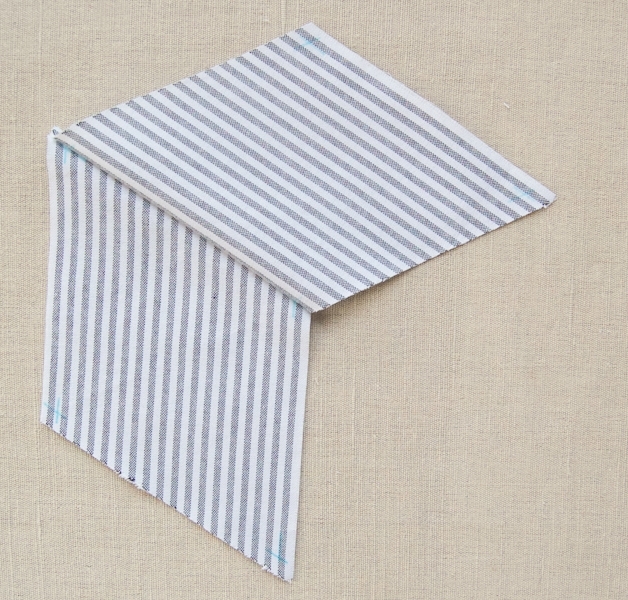 Sew these pinned edges together. The two rows are now sewn together neatly, as shown above. In this manner, sew together all six of the rows in numerical order. The left and right sides will be straight, and the top and bottom will have a zigzagged edge. Orient a Bottom Partial Tumbling Block so it is in the shape of a “V.” Pin and sew its bottom edges to a concave 120-degree angle at the top edge of the quilt top. Repeat this for the 4 other concave 120-degree angles along the top. 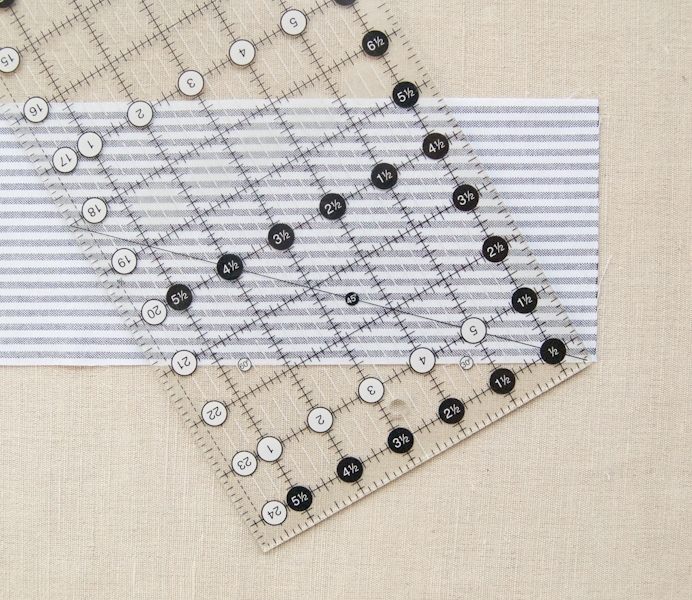 Lay a rotary cutting ruler horizontally along the top edge of the quilt top. Align the top edge of the ruler precisely ¼ inch above the top corner of Row 1’s Full Tumbling Blocks. 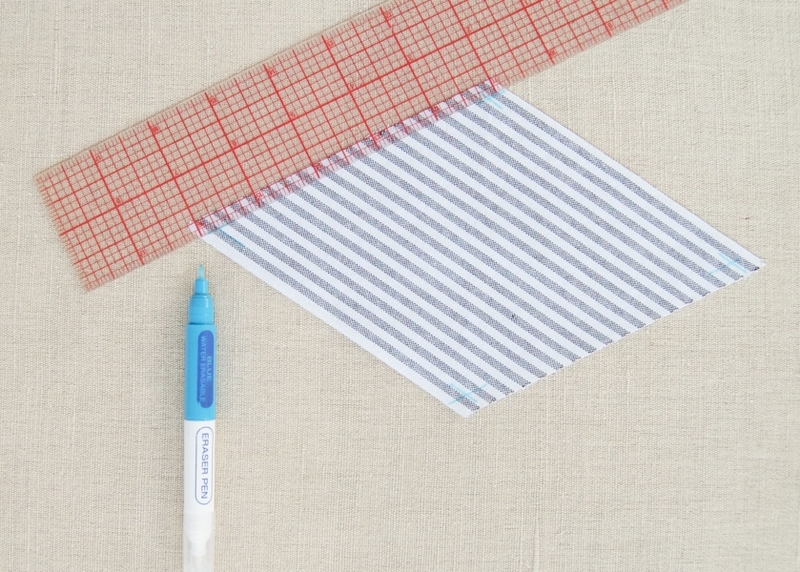 Use a rotary cutter to trim along the top edge of the ruler. Sew the bottom edge of a Piece C to the top left corner. Cut off the top of this piece to align with the top edge of the quilt. Sew the bottom edge of a Piece B to the top right corner. 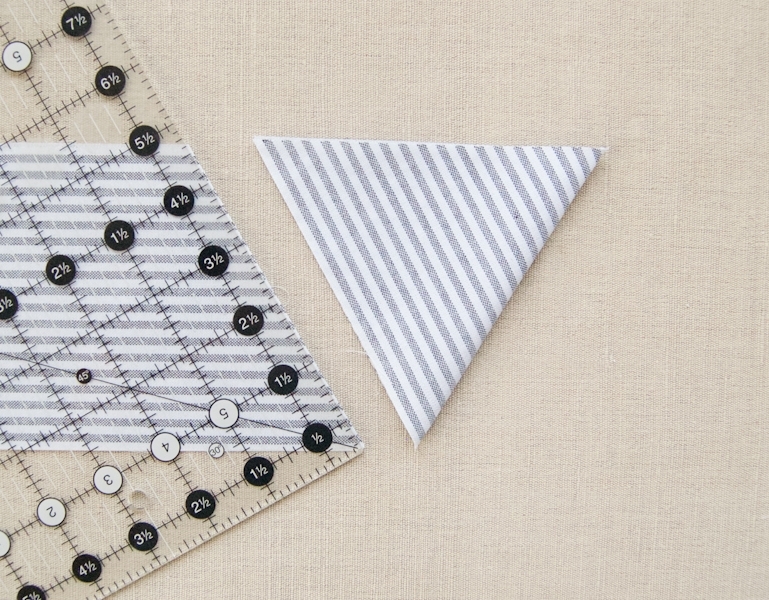 Sew a Piece A to each of bottom edge’s convex 120-degree angles. First sew Piece A’s top left side to Side 3 of the left-hand Full Tumbling Block. 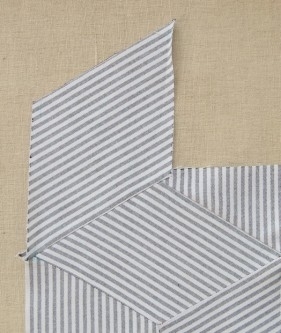 Then sew Piece A’s top right side to Side 5 of the right-hand Full Tumbling Block. Line up the rotary cutting ruler horizontally so that its edge is ¼ inch below the bottom corner of Row 6’s Tumbling Blocks, and trim Piece A.
Repeat for the 4 remaining convex sections along the bottom edge. You are now done piecing the quilt top. It should be a nice, trim rectangle! Turn the quilt top so that the back side, with all of the seam allowances, is facing up. On the back you will be focusing on the areas where six pieces all come together, like the center of a 6-pointed star. 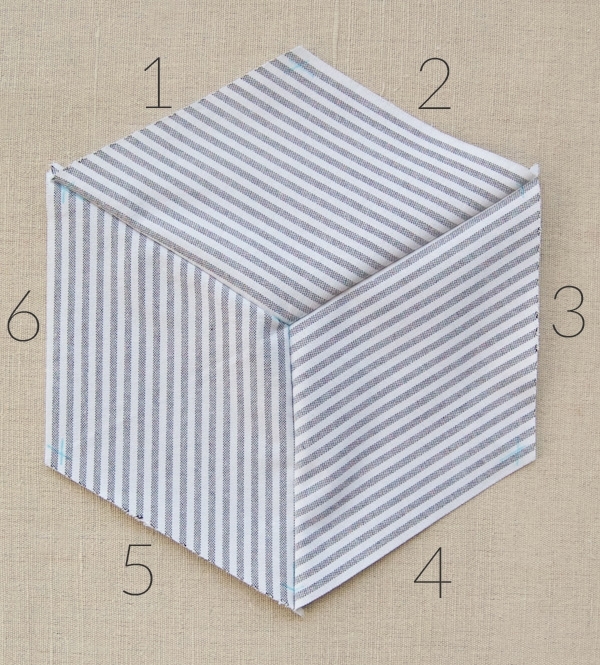 Press the seams clockwise around the each of these 6-piece intersections. Once you do this, flip the quilt top so that the front is facing up. 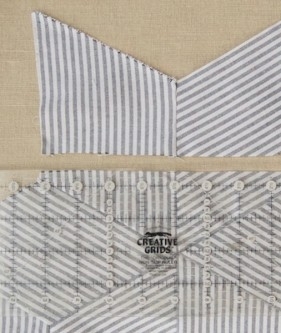 Press the top flat, while keeping the back seams arranged in this manner. 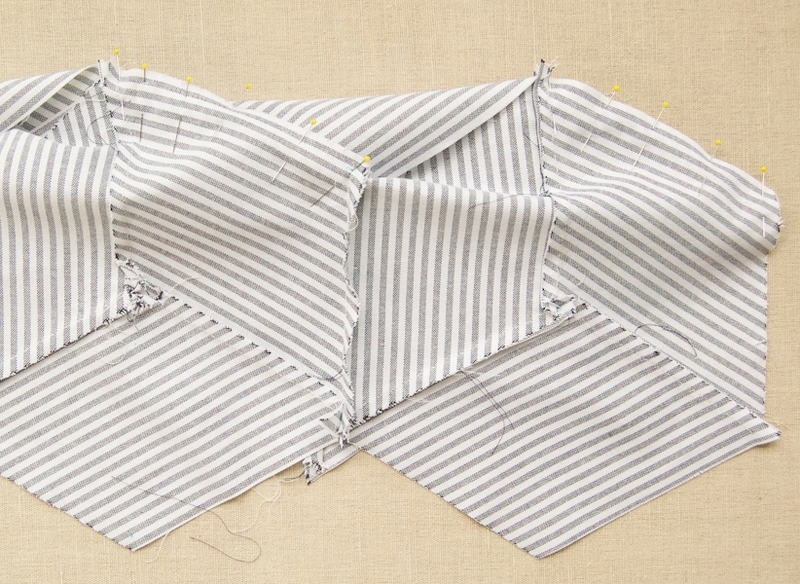 Start by sewing a horizontal zigzagged line across the top of Row 4, moving left to right. 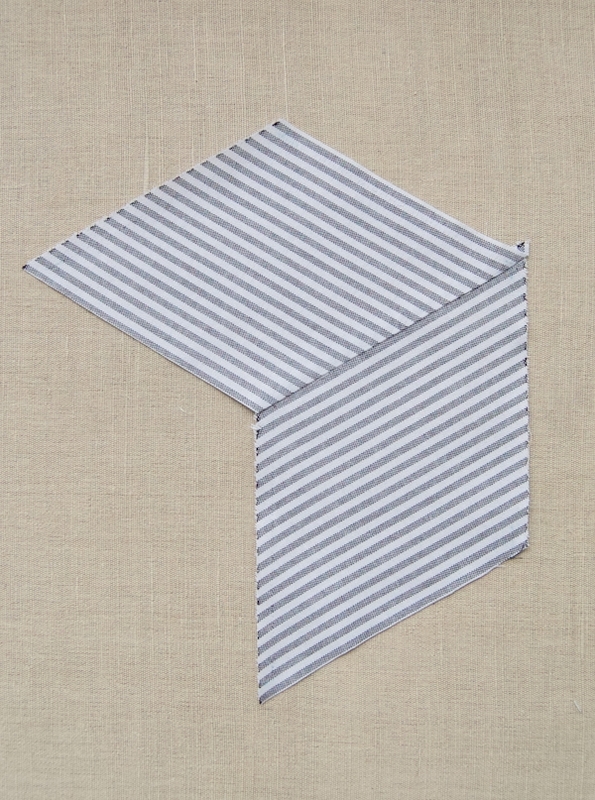 The gray arrows, above, represent this line of quilting. Next, moving from right to left, quilt along the zigzagged line right below the previous line. 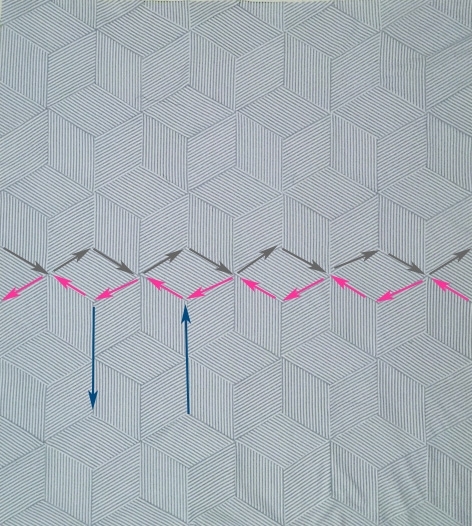 The pink arrows, above, represent this line of quilting. Repeat this process, reversing direction for each zigzagged horizontal row. First work the zigzagged rows below Row 4, then work the rows above Row 4. After you have quilted all of the zigzagged lines, quilt along the vertical lines, represented by the blue arrows above. Start quilting the vertical lines at the bottom of Row 4, working first the bottom half of the quilt, then the top half. 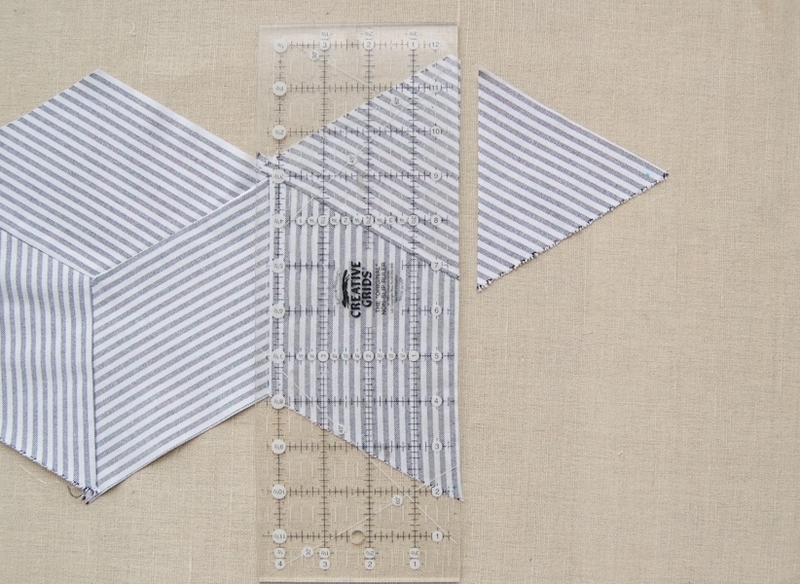 Alternate directions for each line of quilting, and be sure to backstitch at the beginning and end of each seam. 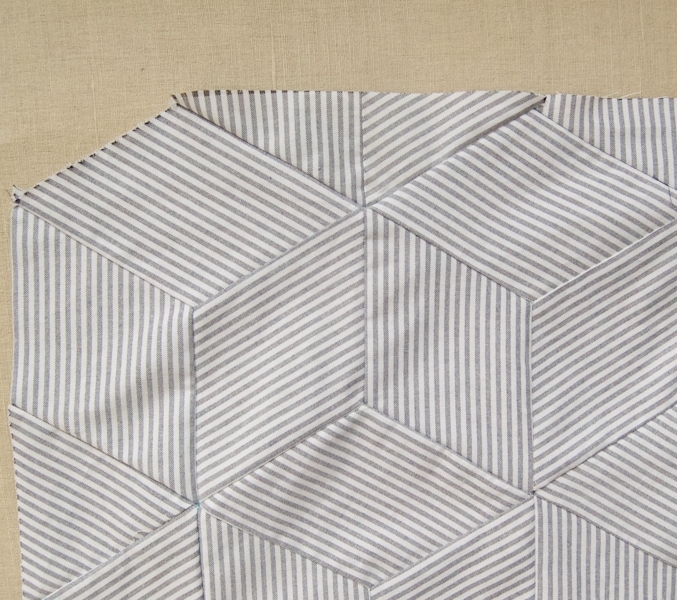 Always try to quilt on the side of the seam without the seam allowance, which means a slight shift as you pass through each 6-point intersection. When you are done quilting trim the batting and Backing along all four sides so that they align with the Quilt Top. Use the Binding Strips to bind the Quilt with double fold binding. For instructions on how to do this, please check out our Making Double Fold Binding Tutorial, and then our Sewing on Double Fold Binding Tutorial! In the photos, the black stripes read very much as medium-light grey…is the color in the photos accurate? 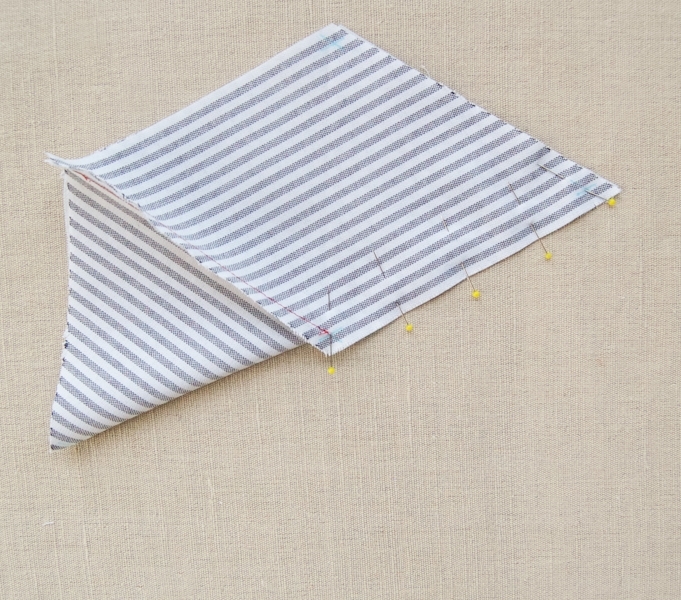 I’d love to sew this quilt with this stripe and the yellow stripe combined, but grey and yellow are what I’m going for, not black and yellow. 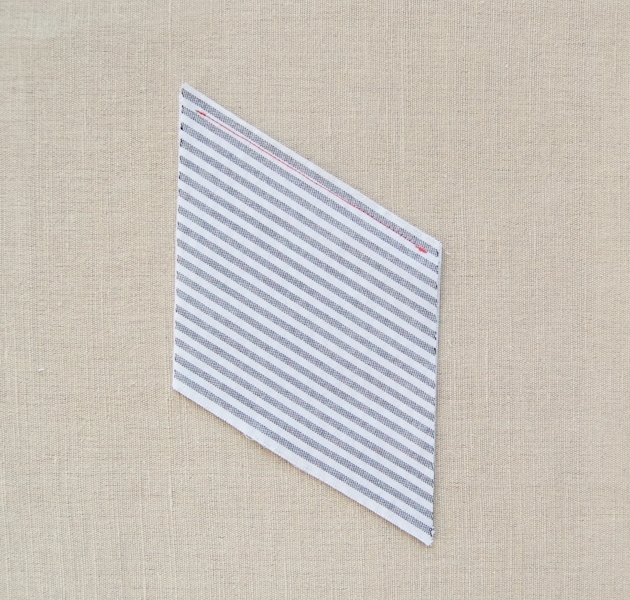 The stripes on this fabric look light gray, as in the photos, not black. The reason this fabric is called “black” is that the thread used in weaving the stripes is black, but it woven with white which makes it look gray! I hope this answers your questions, please let us know if you have any more! This is gorgeous! I’m just starting to learn to sew and quilt. I’m wondering…what is the reason you rarely see patterns for larger/king size quilts? Is it too hard to maneuver the fabric without a long arm machine? Too expensive with all the fabric? Going to make you want to claw your eyes out by the end of it?! Just curious… I really need a blanket or quilt in king, and have this crazy idea I’ll make it. Can patterns like this be sized up? Thanks! I do think that quilting very large quilts is hard on a home machine but it’s certainly easy enough to send out larger pieces to a long arm quilting service! I know that we like to keep our quilts smaller and more manageable and that’s why we don’t offer many king sized projects. However, this particular quilt is fairly easy to size up! To make it for a king sized bed you will just have to make more Tumbling Blocks. I would suggest that you measure how large you want your quilt and work from there- keeping in mind that each Tumbling Block is approximately 7 3/4-inches wide and 7 3/4-inches tall and that you need 3 of the parallelogram pieces per Tumbling Block. You can assemble the quilt in exactly the same manner for any size! That looks really neat with the striped fabric! 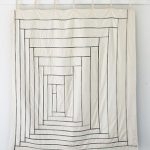 I’ve seen other tumbling blocks quilts, but the stripes really accentuate the design in a unique way. I’m saving these instructions for when I’ve got a bit more quilting experience & confidence under my belt. I’d love to do it in alternating rows of two colors. Love ant can’t wait to try it. 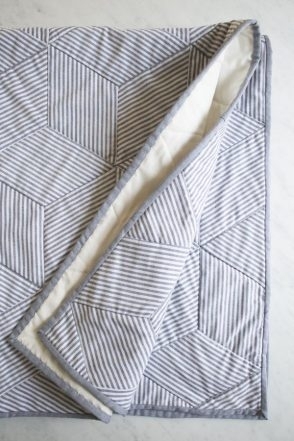 If I wanted to make a larger size, queen bed sized quilt, how much fabric would you recommend and are the steps the same? To make it for a twin sized bed you will just have to make more Tumbling Blocks. I would suggest that you measure how large you want your quilt and work from there- keeping in mind that each Tumbling Block is approximately 7 3/4-inches wide and 7 3/4-inches tall and that you need 3 of the parallelogram pieces per Tumbling Block. You can assemble the quilt in exactly the same manner for any size! Fabulous! This just about convinces me to lift my self-imposed ban on quilting. Maybe just one more…. This is gorgeous. Any suggestions on increasing it to a queen sided bed? To make it for a queen sized bed you will just have to make more Tumbling Blocks. I would suggest that you measure how large you want your quilt and work from there- keeping in mind that each Tumbling Block is approximately 7 3/4-inches wide and 7 3/4-inches tall and that you need 3 of the parallelogram pieces per Tumbling Block. You can assemble the quilt in exactly the same manner for any size! I’m not sure that I am going to make the Tumbling Block quilt but I thoroughly enjoyed reading the tutorial. Each step is precisely described and the photos are wonderful. 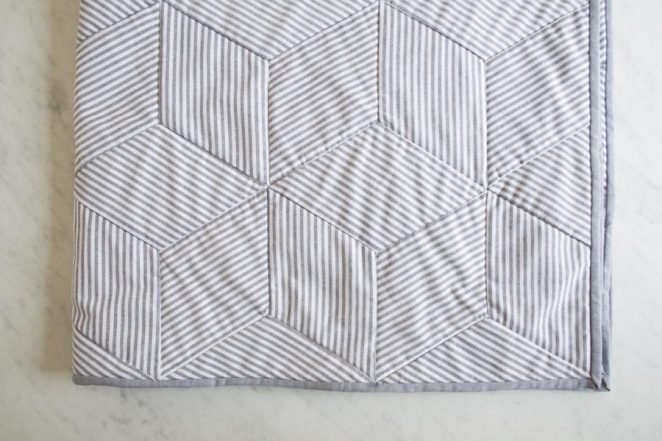 Though, as you stated, this quilt may not be for the beginner, I think that you have provided a great tutorial and it would be difficult to not be successful making it! Thank you so much for this sweet comment! And if you ever do decide to make it we are always happy to help with any questions you may have! Love the pattern, plan to try it. Thanks for the gfeat tutorial! So my question: it says not necessarily for a beginner. I haven’t made a quilt. I HAVE sewn plenty of other things, including many stuffies, etc… you know, projects that don’t necessarily have the most straightforward construction. Is there anything I’m not seeing that I should be concerned about if I’m not anxious about the project overall? Just looks to me like follow the directions and put the puzzle together and it should all work out… right??? It sounds like you’re quite an accomplished seamstress! I think you could probably do this, just make sure to read the rotary cutting tutorial linked in the “CUT” section before beginning and follow the instructions carefully. Also be very very mideful that you are sewing with a precise 1/4-inch seam allowance (use your machine’s 1/4 inch foot) because if the seams aren’t uniform and straight the quilt won’t lie flat. Let me know if you have any more questions and good luck! Hi Molly. 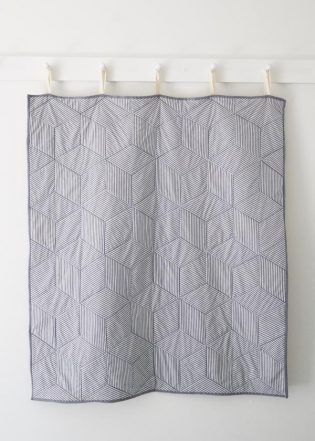 I have just completed the top for this quilt but I have questions about the quilt sandwich even after reading the tutorial. Do I trim all the parts (top, batting, backing) before or after pin basting? You did not include the link to the binding tutorials either and I would like to look at those before continuing on this project. Thanks for your help. This is a really nice quilt and once you get the hang of it, it goes together quite easily. OK so I found the tutorials for quilt sandwich and pin basting but nowhere do I see where it says anything about trimming away the extra fabric for the backing and batting. I don’t want to continue my project until where exactly this step comes in. Sorry, I don’t mean to be a pest about this. I love the quilt so far and the tutorials are very helpful. They just don’t have the answer I need to my question. Thanks so much for getting in touch. First of all those two tutorials should have been linked within this post. Sorry about that, I have fixed the links. Also, thank you for pointing out that we didn’t include any info on when to trim the backing and batting. That is now at the end of the Quilting section of the pattern. Thank you again for bringing these errors to our attention and please let us know if you have any more questions! Great quilt design. My daughter wants a King Size bedspread (gulp). I’ve made a couple of quilts, so feel like I could probably handle. But I do have some questions if you could help? 1) Are you cutting the parallelograms right side up? I found that for some reason I could not get right side up to match your ABC picture. But it worked wrong side up. But after sewing it was of course reversed so not sure (rows) pieces would go together correctly via your instructions if reversed? (or would it all work out OK in the end? – i.e. 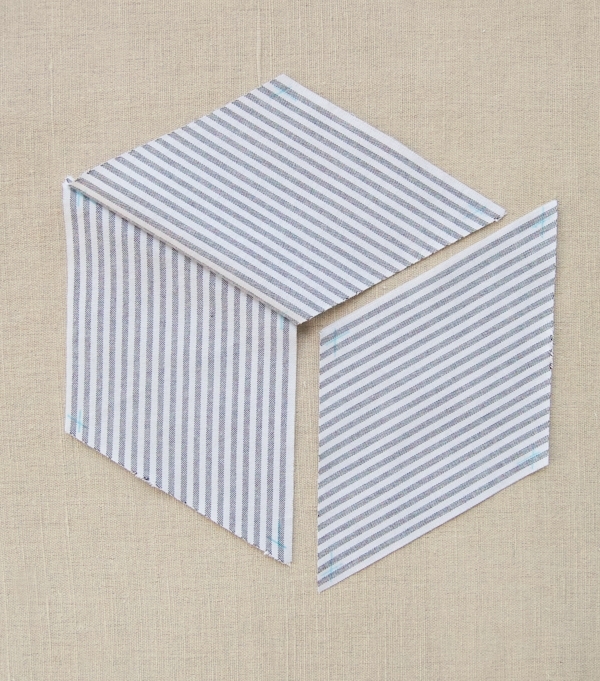 partial cubes, etc). 2) When quilting, I understand the horizontal part, but not sure on the vertical instructions. Is it just thru 2 blocks and then skip the next parallelogram where there is no seam (i.e. probably “A”)? 3) Your fabric recommendation? 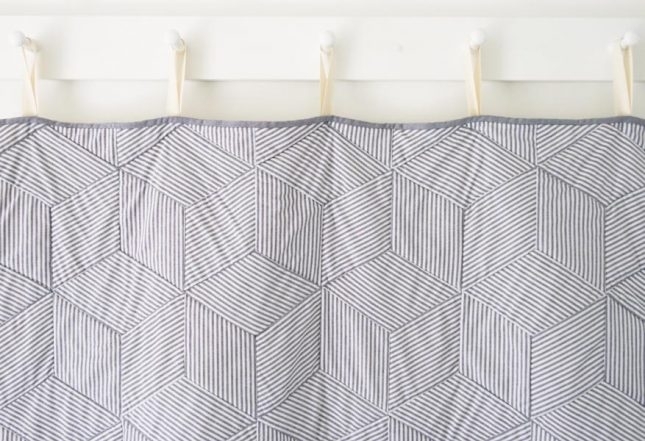 Is it necessary to keep lines perfectly straight even if not printed on fabric exactly straight? I tested with seersucker and was a bit off? 1) I’m not sure what you mean by right side up? You can feel free to email me a photo at purlbee@purlsoho.com so I can try to see what you mean. 2) Yes, sew through the two blocks, pick up your needle and put it down into the next un-quilted section directly to the right or left, depending on which way you are going. 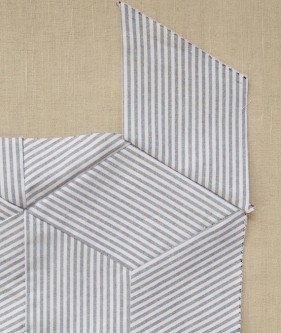 Basically you will be quilting along every pieced seam. It might become a bit more clear as you’re doing it. 3) You should try to keep them as straight as you can. Seersucker would be hard not only because it’s harder to cut straight, but because it’s textured. I would highly recommend using a flat fabric. Please let us know if you have any more questions and good luck with the project! 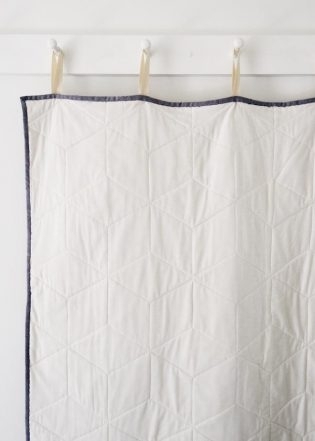 Is there any way to strip piece this quilt? Y seams are not my friend! Unfortunately traditional tumbling blocks always use Y seams. 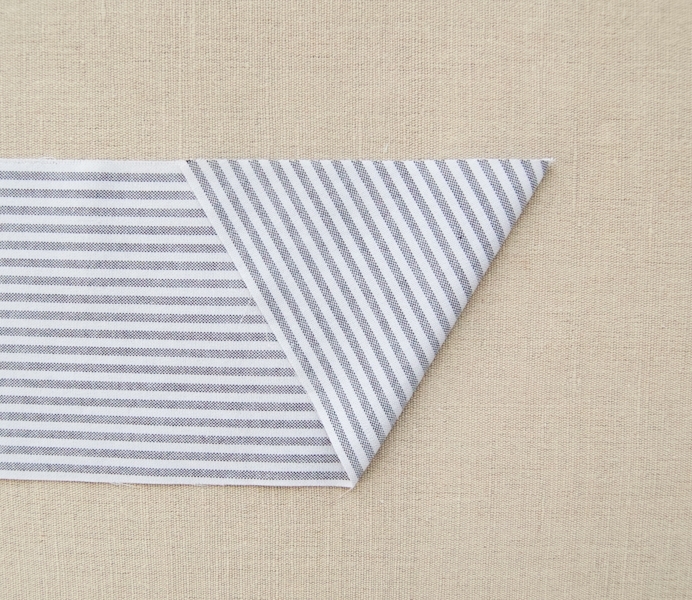 There are easy “no Y seam” versions that usually involve sewing triangles together so they create a tumbling block illusion. I would try googling “easy tumbling block pattern” or “no Y seam tumbling block” to see those. 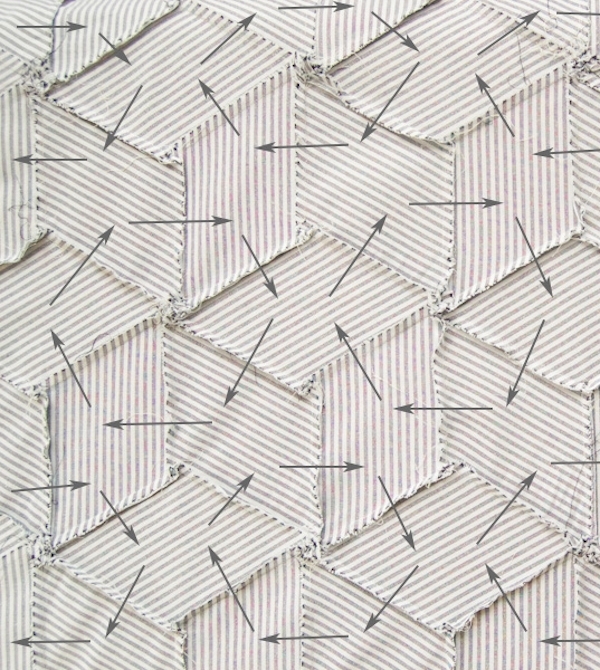 But for this particular quilt you will need to sew Y seams. 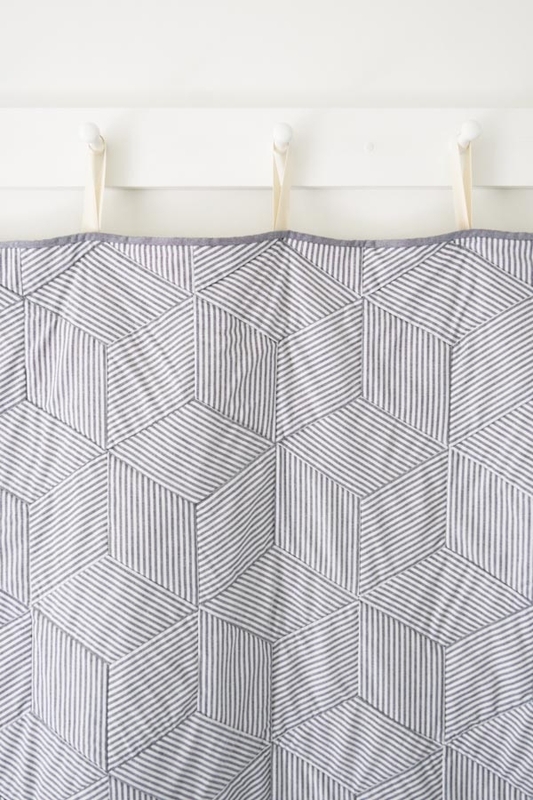 The good news is that this pattern lays out the process in a way that makes it pretty easy! I was afraid of Y seams for many years but once I discovered this method I realized it wasn’t as hard as I’d feared. We are also happy to answer any technical questions you have about the process as you go. I am working through this and it looks as if the pattern shifts from right side to wrong side after it has been marked. So all of the pieces I cut are not matching up to the A, B, C diagram. I plan to just switch the way the blocks go. Is this correct?? You are correct and the pattern has been edited to be more clear on this point. 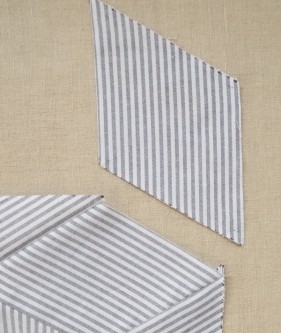 You are cutting on the wrong side of the fabric and then flipping the pieces over to their right sides before you start marking them and piecing them. This confusion stemmed from the fact that the fabric we used doesn’t have a clear right and wrong side. 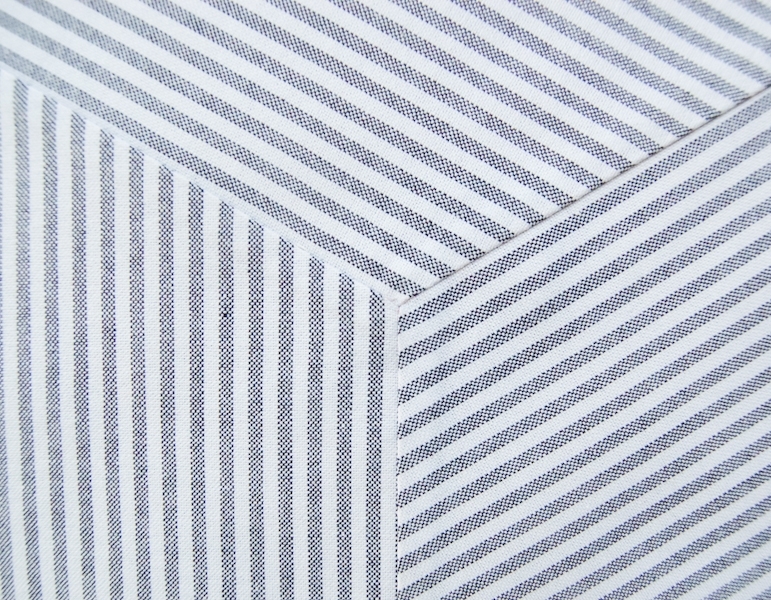 However, if you have already cut your fabric in the wrong orientation you are correct that you can just flip the orientation of the tumbling blocks themselves so that the stripes of “A” will run upwards from left to right, the stripes of “B” will run vertically, and the stripes of “C” will run downwards from left to right. It’s not clear whether you cut the fabric right side up or wrong. I cut out a few right side up and they matched up on the wrong side. So, it must be that you’ll need to cut them with the WRONG side facing up. Thanks for verifying! You are correct, you cut with the wrong sides facing up! The fabric we used doesn’t have a clear right and wrong side which is where this confusion came from. Thank you so much for pointing it out! I have updated the pattern to make it more clear. 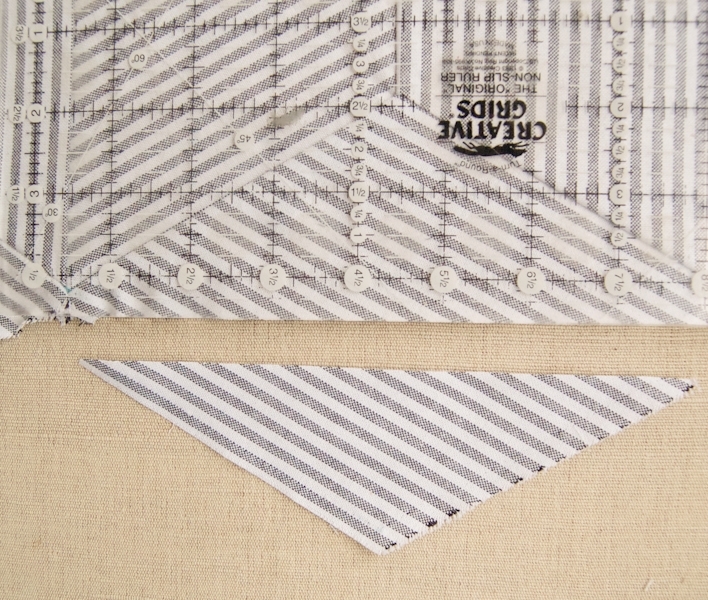 Also, can you verify which fabric face you are placing the 1/4″ corner markings? Right sides or Wrong sides? It is the right sides. I have updated the pattern to make this more clear. Thank you so much for getting in touch and pointing out this confusion. 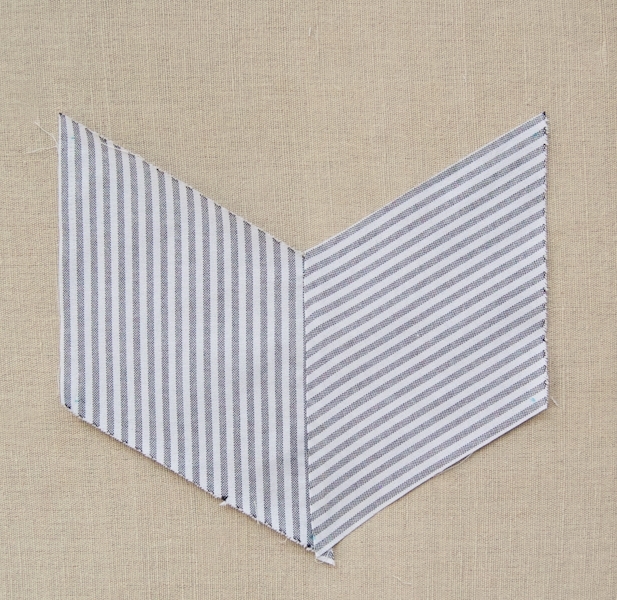 Why are the pieces’ 1/4″ markings marked on the right side of the fabric? Because the pieces are sewn right sides together, it appears to me that marking on the wrong sides will make it easier to match the Y seam end points of each piece because the marks will be clearly visible on the wrong sides. Thank you for writing in! Sorry for the terribly long delay in responding to your question. 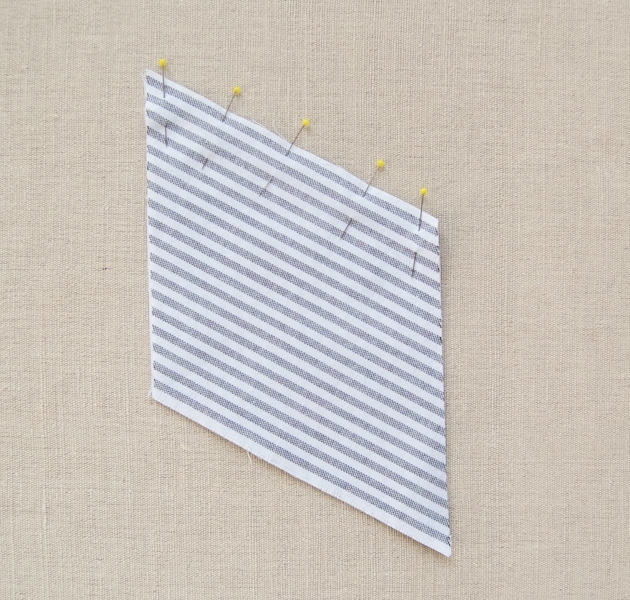 The 1/4″ X’s are on the right side of the fabric so that you can place them directly on top of each other as you pin. You place the pins exactly through the Corner Point of both pieces, lining them up as perfectly as you can. You can mark them on the wrong side but that would make it slightly less exact. I have started to cut out the tumbling blocks according to your directions. I have cut a 54″ x 4 1/4″ strip, lined up my ruler at 60 degrees but end up with a parallelogram that only measures 5″ per side not 5 1/4″ as described. I do not want to cut all of them put wrong. Will the 5″ piece work? Am I doing something wrong? The measurement is actually closer to 5-inches plus a scant 1/4-inch. So as long as all of your parallelograms are the same size and they have two 60-degree angles and two 30-degree angles you should be fine. Thanks for your question and please let me know if you have any more concerns! I am an intermediate + sewer but I have never tried to quilt. 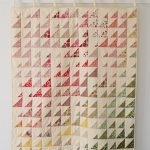 Would the “tumbling blocks quilt” be over my head. I have just become the proud owner of a Bernina sewing machine. Thank you for the suggestions. The pinwheel quilt looks like an option. Could you also suggests some basic tools to start quilting ie ruler, etc. I have seen the different items on line here but not sure where to start. 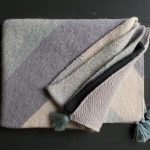 Yes, we highly suggest our rotary cutting tool kit which is linked in this project under the “Materials” headline or just go here: https://www.purlsoho.com/purl/products/item/9818-Purl-Soho-Rotary-Cutting-Tool-Kit It has everything you need to do all of the cutting for any quilt. You will also need to get a 1/4″ foot and a walking foot for your machine. You can do this online by searching the name of your machine and walking foot/ 1/4″ inch foot. I love this quilt! Great tutorial. I’ve been itching for a project and think I’ve found it, but I’d like to do this as a lap quilt. Do you have a favorite size you go by? How much fabric would you recommend for that? Thanks! I think a a good lap size is 60 X 50 or thereabouts. I would recommend getting an extra yard of the fabric and picking up wider muslin for the back. I want to make this quilt in a double/queen size. Your advice is to increase the fabric (striped?) to 5 yards from 1-3/4? I should probably get the wider muslin as well (90). How many yards do you think I need of the solid black for the binding and the muslin for the backing? 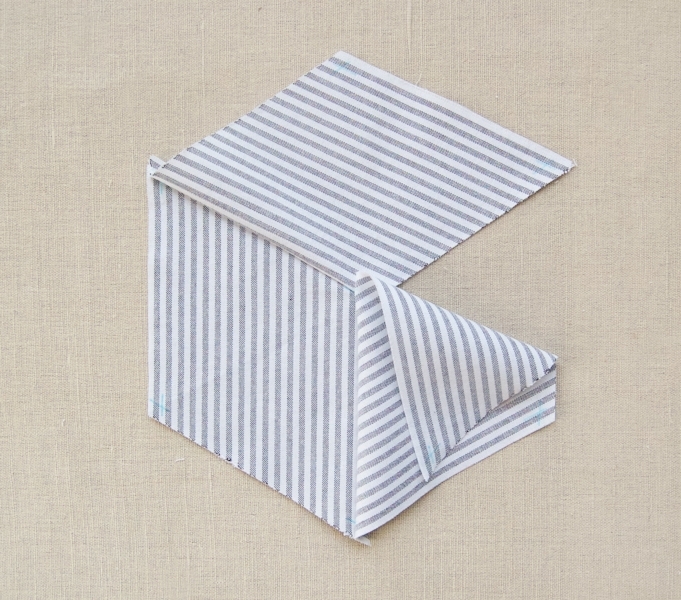 I’m wondering if a crocheted version can be made by making a bunch of parallelograms? Really love the look of it. Sure. I imagine this could be really beautiful! If you Google “Tumbling Blocks” I imagine lots of stuff will come up. What loft batting should I use? Thanks for writing in! You can use any loft batting that you would like. We find that the thinner lofts work better on standard sewing machines. Here Select or Deluxe would both work very well without needing specialty tools. OMG! I love this one as well! Do you have a downloadable pattern available? Thank you so much for your kind words! This lovely quilt has no downloadable template however, you can download the pattern above as a PDF! 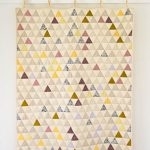 I really want to make this quilt! Since it’s been 2 years since the post the Robert Kaufman fabric is impossible to find. Do you have any recommendations for another fabric? Would really appreciate a reply. Thanks for writing in! 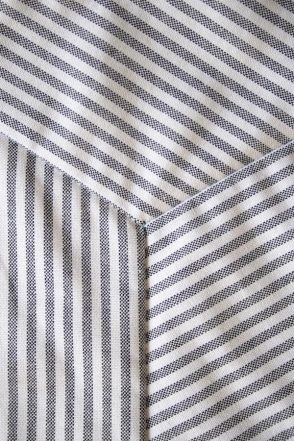 This lovely striped Oxford has, sadly, been discontinued by Robert Kaufmann. 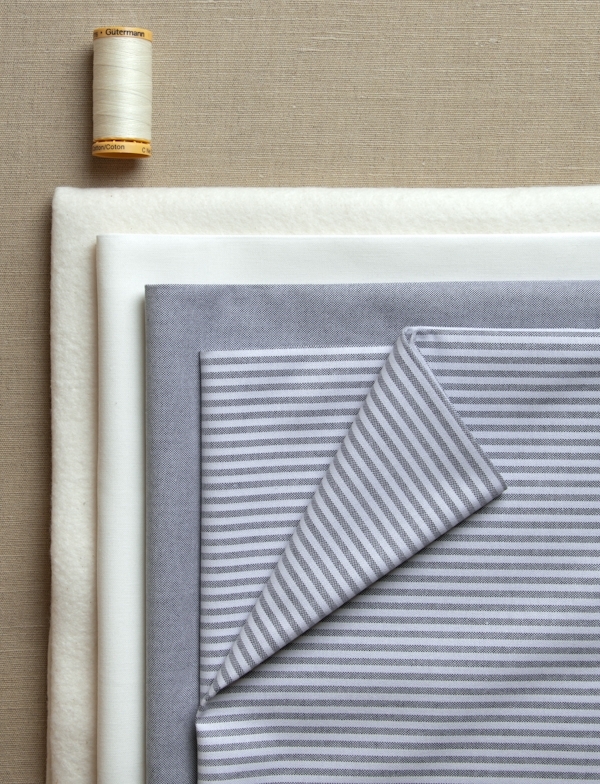 While the fabric has quite a different hand, the Sevenberry Petite Basics line has a number of striped options that could work well here. The fabric is a bit thinner but it is a quilting cotton and would work just fine for this lovely quilt! I finally found the fabric on Etsy! Put in stripped black fabric into the search. I made this quilt last summer for a friend’s new baby, and it turned out absolutely beautifully — I got SO many compliments on it. I enlarged it to queen size and my base pieces were parallelograms that measured 6 3/4 inches across their widest points — I cut 105 pieces total. 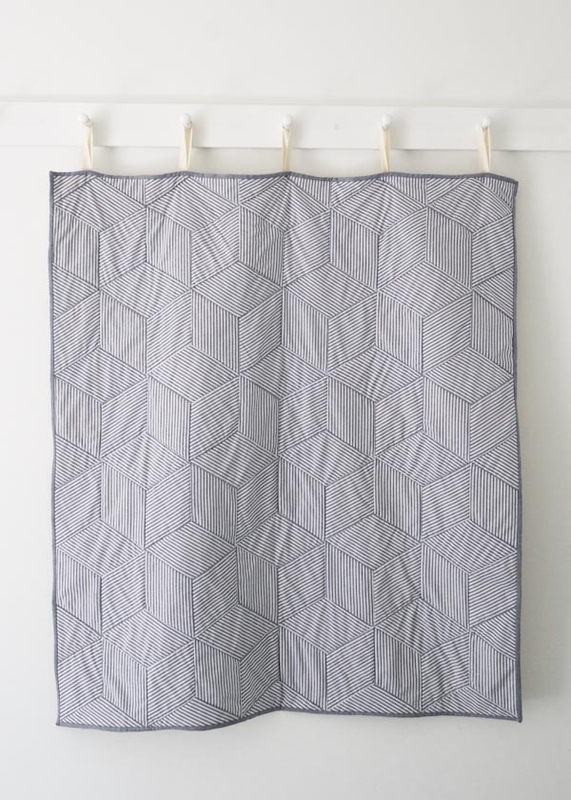 Thank you so much for posting this gorgeous quilt pattern! Thank you so much for sharing! We are so glad that the quilt was such a hit! Best of luck on your next one! Love this quilt. 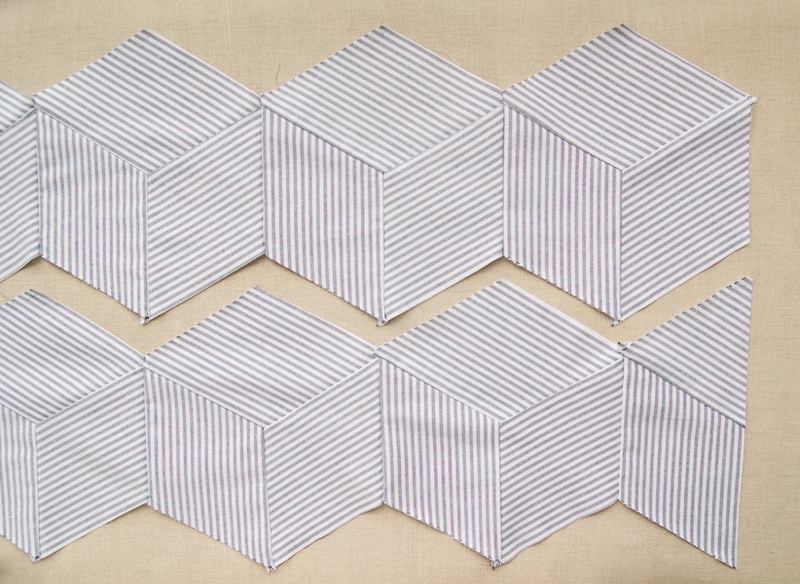 I have made a tumbling block quilt before. My question is do you have a printed pattern of this for sale? Or is it just the tutorial on line? Thanks for reaching out! We do not sell a printed version of this pattern – however, our free tutorial does include all the steps you need to make the quilt! If you would like to print your own copy, on a desktop version of the site, you will find a “print” icon in the right column just below the date and tags. If you’re on a mobile version of the site, you will find a “print” icon below the pattern and above the comments. 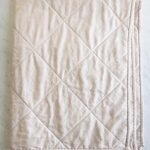 Are there any alternate yarn dyed fabrics you may suggest for this quilt as the original fabric is now discontinued? Would love to make this one but am having a hard time finding any suitable alternatives! Thanks for writing in! 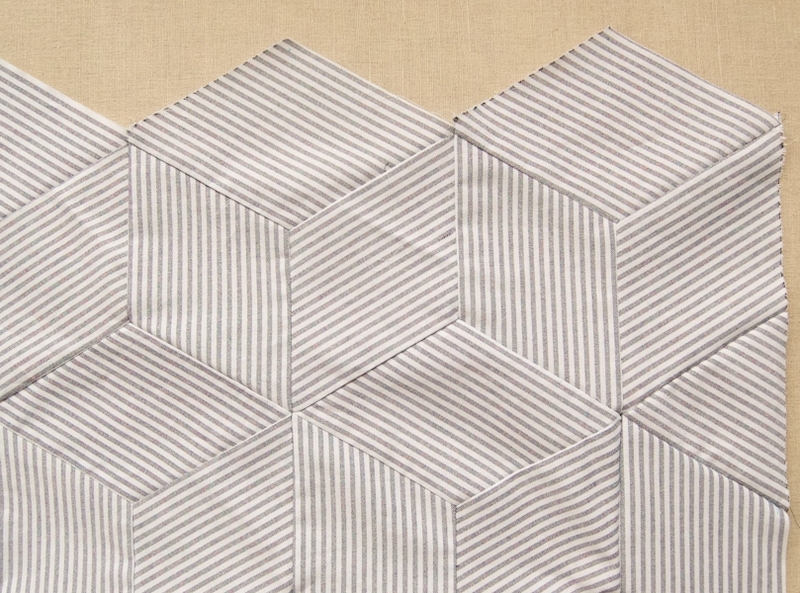 Any woven or printed striped fabric will work to mimic the effect we achieved in our original quilt – although we don’t carry many right now, I think you could make a really interesting modern version using the striped prints of Nani Iro BEAU Yin Yang. Traditional tumbling block quilts are done in solid or small prints, utilizing darks and lights to emphasize the three dimensional illusion, which would be really fantastic in almost any fabric, including Liberty Tana Lawn Classics and Seasonals or even Kona Cotton. If you Google Image search “tumbling block quilt” you will find lots of great color inspiration that will work with this pattern! I have made this as a king size quilt. Each diamond traced by hand individually with a pencil so my sewing lines were my tracing lines,I used a template. I made it in colors that Joanne Fabrics had put together for a block of the month that they also sold in yardage.It is in colors of peach,wine,greensand tans and light yellows. The light colors always on the top, the darker color always to the right and the mediums always to the left. My son died 14 years ago and I needed some tedious, mindless, steady,careful hand sewing and this was perfect. It is truly beautiful. I have handquilted some of it, but elbow and hand surgeries have prevented me from finishing it. So, I folded it in thirds and hung it from a sturdy curtain rod in my living room. No rod pocket needed ,a king size is so big that I needed to fold it over the rod. The colors are so beautiful that my daughter painted the living room last Dec. to highlight the quilt! I look at it every day with love. Some day it will be finished. If I could figure out how to take a picture of it, I will send it to you. Thank you so much for sharing with us! Your story is so touching and we are always so amazed by the amazing work our community does! Your story is so inspiring and thank you so much for sharing it with us!